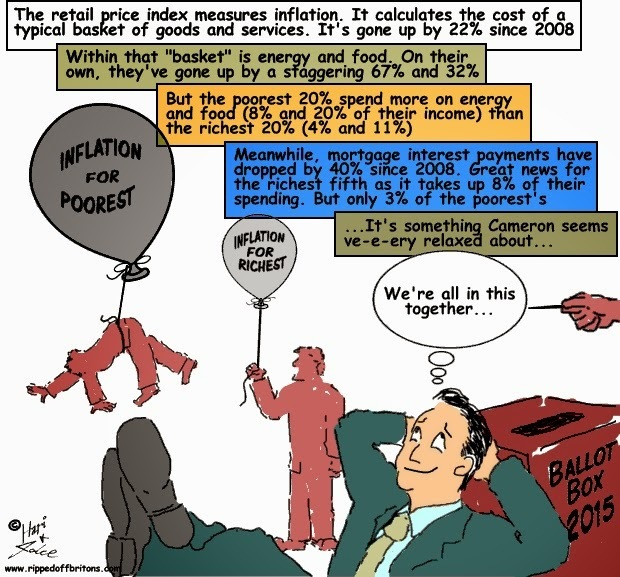 The study by the Institute for Fiscal Studies (IFS) for the Joseph Rowntree Foundation said the government method for calculating absolute poverty – the number of people living below a breadline that rises each year in line with the cost of living – incorrectly assumed that all households faced the same inflation rate. But in the six years from early 2008 to early 2014, the cost of energy had risen by 67% and the cost of food by 32%. Over the same period the retail prices index – a measure of the cost of a basket of goods and services – had gone up by 22%. Therefore, the soaring prices for food and fuel over the past decade have had a bigger impact on struggling families who spend more of their budgets on staple goods. The IFS report said the poorest 20% of households spent 8% of their budgets on energy and 20% on food, while the richest 20% spent 4% on energy and 11% on food. In contrast, poorer households allocated 3% of their budgets to mortgage interest payments, which have fallen by 40% since 2008 due to the cut in official interest from 5% to 0.5%. Richer households spend 8% of their budgets on servicing home loans. As a result, the IFS concluded that since 2008-09 the annual inflation rate faced by the poorest 20% had been higher than it was for the richest 20% of households. That meant the official measure of absolute poverty understated the figure by 0.5% – or 300,000.